When faced with tough conditions or matching the hatch with smaller bait fish the Lil Mr. Money Spinnerbait delivers a scaled down profile to draw strikes. The 3/16oz is matched with a premier Vibra-Max wire arm that helps produce maximum blade vibration and the superior quality Spin-Eze ball bearing swivel adds to the blade's action as well. Utilizing a large Indiana blade and a smaller Colorado blade the Lil Mr Money Spinnerbait provides ideal flash and thump. Hidden under Strike King's Perfect Skirt with Magic Tails is a super sharp black nickel hook for excellent hookups. 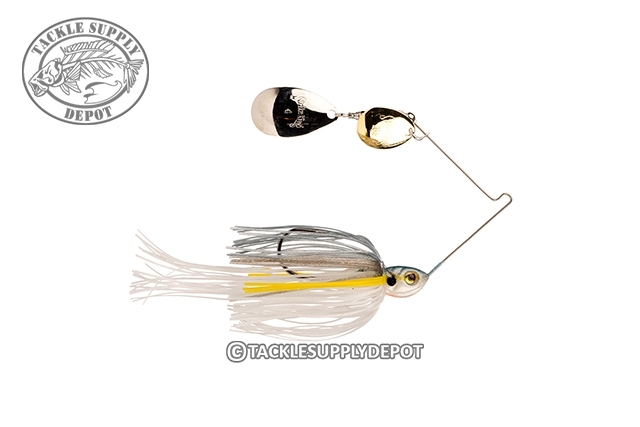 The Strike King Lil Mr. Money Spinnerbait will be one spinnerbait seen in every angler's arsenal. Very nice web site, easy to use and very fast delivery time. I will diffently buy from them again.